*A girl’s never too young to get pampered, especially when you’ve got a famous daddy. Here, Diddy’s twin daughters (Jessie and D’Lilah Star) get a mani and pedi. A girl’s never too young to get pampered, especially when you’ve got a famous daddy. 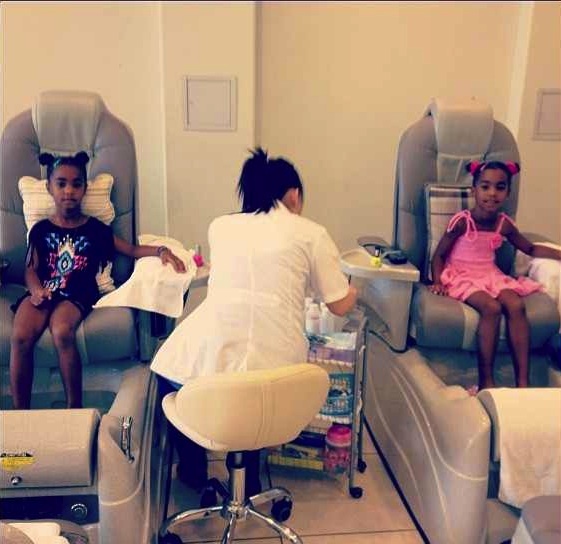 Here, Diddy’s twin daughters (Jessie and D’Lilah Star) get a mani and pedi. Are we getting old, y’all? I feel like these girls are growing at a record pace! This week, we spotted 37-year-old Kimora Lee Simmons window shopping with daughters Aoki Lee (10) and Ming Lee (12) in Beverly Hills, rocking flip-flops, riding boots and heels, respectively. Visit theJasmineBrand.com for more celebrity spottings.